Have you ever seen these? 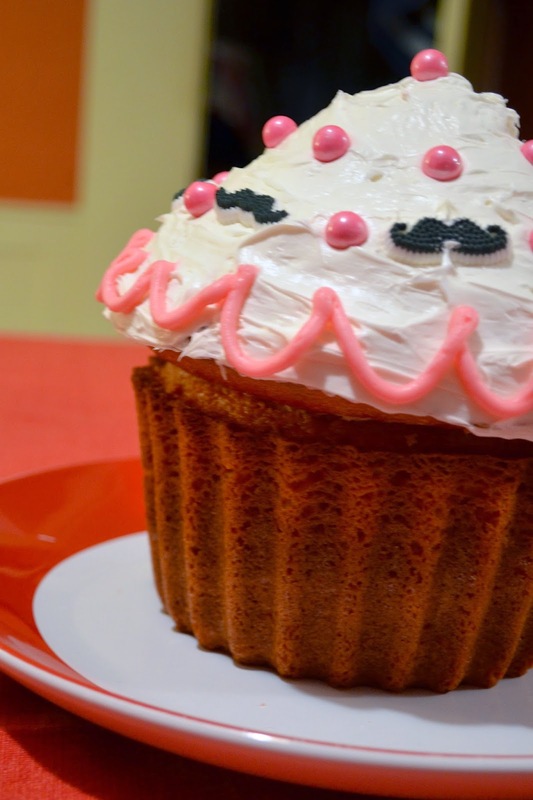 They're large cupcakes - essentially a cake shaped to resemble a cupcake. I had never heard of it until last year when Red gave me the Milton Giant Cupcake pan for Christmas. Silly me never took the thing out for a test run until now, a year later. I couldn't imagine a better occasion to use it for than Red's birthday! And that is just what I did last weekend. Since Cody and Red's birthdays are close (Cody is a Christmas baby and Red was born on December 30th), they decided to throw a joint birthday party after the holiday hullabaloo was over. 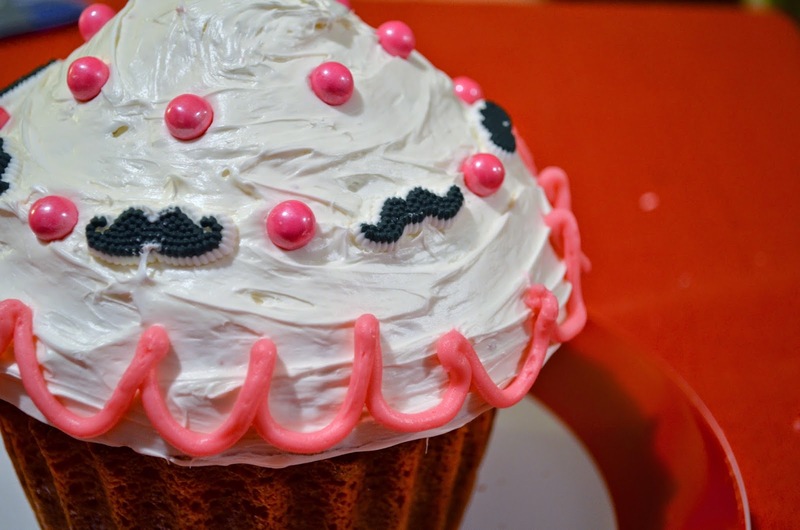 We invited all our friends over last Saturday for some tasty finger foods, fun and fruity (and maybe lethal) punch, and, of course, a massive cupcake. So that cake. With some help from the Milton website, I just went for it. 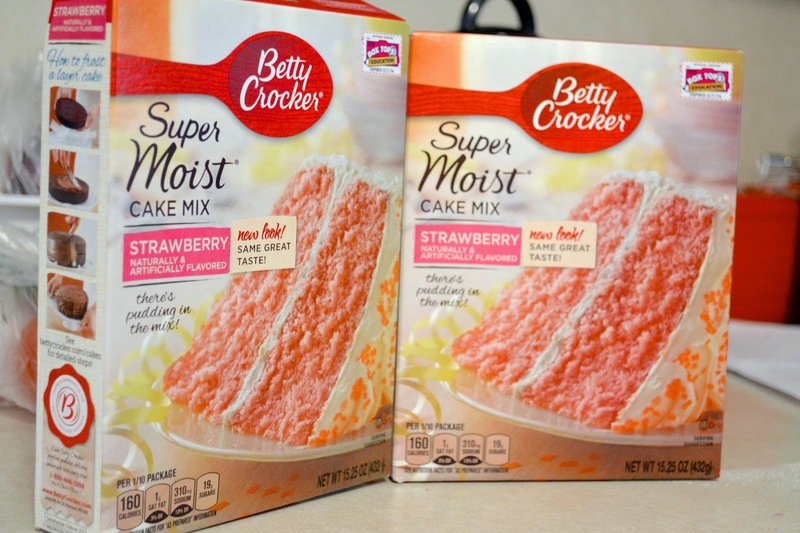 I did what they advised and used two cake mixes (I was going to go all out and make it from scratch but I also didn't know how this was going to turn out so I decided it was best to keep the ingredients simple - cake mix!) and filled up that intriguing cupcake pan, fearing with every step that the cake would not come out of the pan once cooled and I'd end up with chunks of strawberry cake on a plate - parfaits anyone?? After preparing the cake mixes as instructed on the box, I sprayed the pan very liberally with Pam to ensure that the cake would come out of the pan once finished. Milton recommends you pour 2 1/2 cups of batter to the funnel side of the pan (the cupcake top) and 3 1/2 cups of batter to the other side (the cupcake bottom). I'd say those measurements were spot on. I used my super large measuring cup (found in my grandmother's basement years ago!) and got to pouring. AND....drum roll...the cakes came out of the pan no problem! Phew! 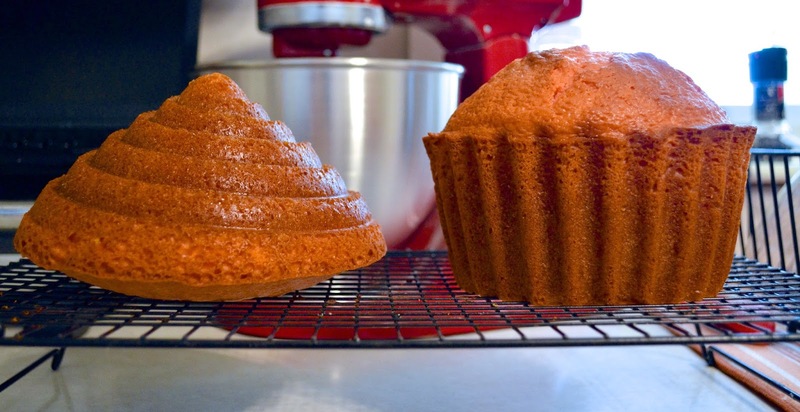 Then, once cooled, I used a knife to carefully level the cakes - the bottom piece needed to be flat on the top and the top piece needed to be flat on the bottom so they'd fit together. After seeing the final product, I definitely could have done some more shaving to make the bottom piece as flat as possible, but I played it safe this time around to ensure success - or something close to success. I decided to just frost the top part of the cake and leave the bottom bare. 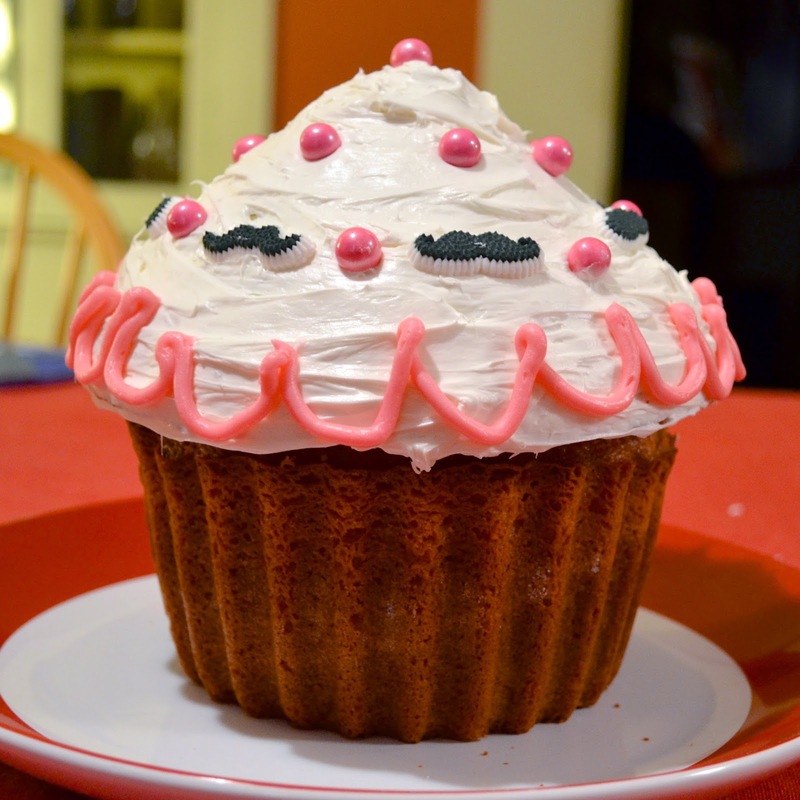 I wanted to make sure it resembled a cupcake and not just some misshaped mound. 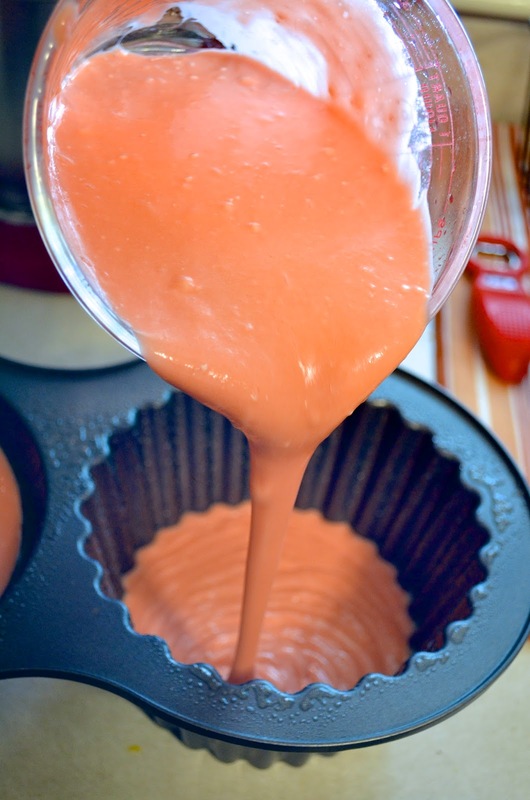 What would be SUPER cute is if extra large cupcake paper liners came with this cake pan. How adorable would that be?? Voila! The giant cupcake was ready to go. OK so my cake decorating skills are questionable. Psh. Whatever. 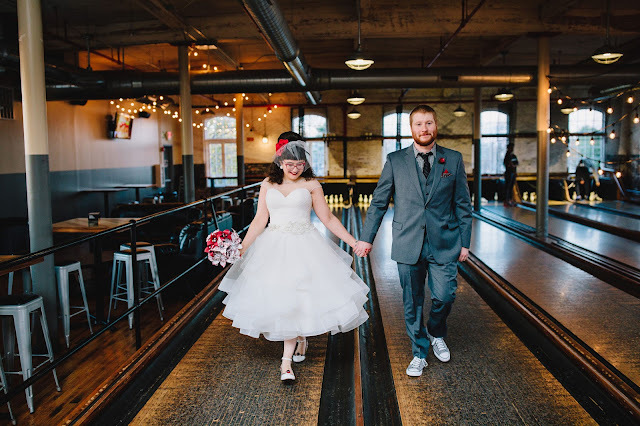 I was just surprised it all came together so easily! Thanks, Milton, for the easy directions and pretty awesome-to-use pan! You'll notice the cake is definitely more suitable for Red and not Cody. This happened for many reasons. For one thing, Cody doesn't have much of a sweet tooth. He doesn't care about cake and didn't even want one. He even told me to just give him a glass of scotch with a candle in it (which he did end up sort of getting for his birthday, read on in a recent post). So I made Red's favorite (it's also mine) - a strawberry cake. Right there, I knew it was going to be a girly one since the cake is, oh I don't know, bright pink. 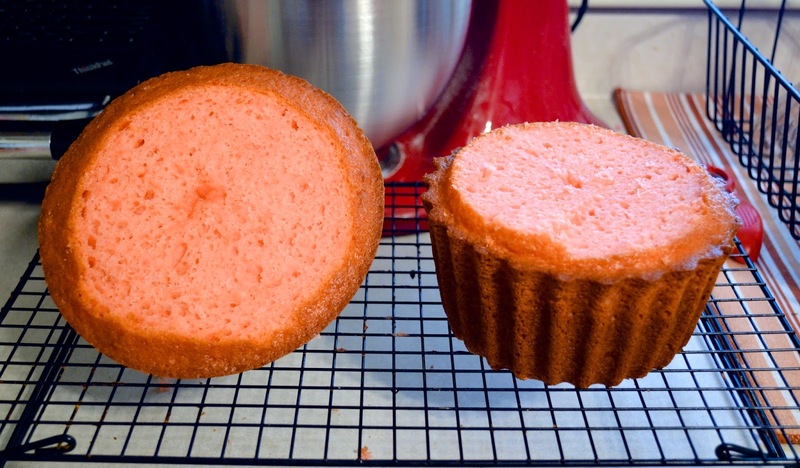 I knew I'd frost it with a basic vanilla frosting so this brought me to the topic of decoration - I'd want to match the cake, so pink all around it was going to be! I added the mustaches for Cody, though he didn't seem too appreciative or even aware of their existence...but he was probably busy sipping birthday beverages in the other room.